I consider myself an avid doodler but have never really taken an official drawing class, there always seemed to be something I found more exciting like jewelry making, or painting, or photography. But as I got farther along in my major requirements (I'm a visual studies major), it became more and more obvious how fundamental basic drawing skills are. My doodles have always been abstract, geometric designs, and that is still what I enjoy drawing the most, but I always considered myself pretty terrible at realistic drawing, especially drawing from life rather than a photograph. In this sense, I surprised myself in this class. 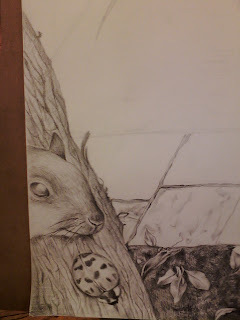 I by now means claim to be the next big thing, but the fact that I was able to, for example, draw a squirrel that actually looked like a squirrel or a a still life that had close to correct proportions was not something I expected to happen. I entered the class sort of grudgingly, viewing it as a sort of pre-requisite for someone with a creative major, but I really enjoyed this class much more than I thought I would and got more out of it than I expected. One of the things I found the most challenging was perspective. Getting the right angles to successfully show an object in the right perspective and right with everything around it. I still struggle with this element of drawing, but I think I have improved. I've learned to not over think it and draw what I see more than drawing what I think it should be. I regret that I wasn't able to draw more in my sketchbook as I think doing so would have helped me improve on this even more, but going forward I hope to keep up the sketchbook as a place for more sophisticated, intentional doodling rather than swirls and zig-zags on the side of my notes. Through this course, I have learned drawing true to my eyes versus my preconceived idea of an object, varying the values of my drawings more, how to work with charcoal as well as incorporate the use of the eraser, and patience when working. Although I have always tried to draw based on the actual ratio I see in front of me, I still let my bias of what an object should look like show through in my drawings. I would lose patience when trying to carefully compare the exact shapes in front of me, and would instead rely partially on what I knew the object should look like. By taking this course, I started working on using my pencil as a guide to finding the true ratio of the subject in front of me, not letting myself slip into my idea of the appearance of an object, and carefully correcting any misguided ratios when finished with a draft of a drawing. Another aspect of drawing I worked on throughout this course was the varying of shades in every drawing. By using the full spectrum of black to white, I could then highlight features of an object, while emphasizing shadows more. I had not drawn with charcoal before this course, so while it was difficult at first to transition to this slightly messier tool, I soon found that I could have a wider range of tones with charcoal than with pencil. Even when I went back and used pencil for some drawings, having some new experience with charcoal helped, as I learned to vary my shades of grey more. Although charcoal definitely helped create darker tones that allowed me to have a wider array of shades, it definitely came with its own problems. As a more expressive drawer, I tend to have stray markings and smudges, and this was particularly accentuated when I tried charcoal. Since I used the spray to prevent my drawings from smudging, and then did not come back to correct them until quite a few days later, many of the smudges that I meant to fix stayed permanently on the page. In the future, I should make to clean up my drawings as a default, and not wait until later. I was surprised by the amount of dust working with charcoal can generate, and got many workplaces covered in charcoal. On the other hand, I found that I could make much richer, darker tones with charcoal, and that shading with charcoal came much more naturally to me. While I usually just use my finger for smudging pencil, I turned to tissue paper, paper towels, napkins, and eraser. Similar to painting, I would start by smudging a grey shade over a large area with a paper towel, just like a large brush. After etching in smaller markings of charcoal, I would blend those with a folded tip of a napkin, using it like a medium sized brush. The eraser would give an even smoother blend, and would allow to put in little details and highlights. This brings me to another aspect of drawing that I had not fully taken advantage of until I learned to do so from this course: the eraser. Although I had painted mountains before, I had never been able to draw them to my satisfaction. When Bill showed us how versatile the use of the eraser can be, I tried to use an eraser to carve out the details of a mountain, and in this way create the effect of shadows, snow, and the crevices of the rock. In this case, I used the eraser more than I used the charcoal, and after that drawing, I used the eraser more than ever. Lastly, this course taught me patience when drawing. I love capturing the details of subjects, but have not really had the patience in the past to complete many drawings. I would get wrapped up in the details of one section, but would tire of the subject and give up before I could complete drawing the object. Having taken The Art of the Comic Book (a really really fun and awesome class - everyone should take it) last year, I had drawn simplified versions and paid less attention to shading. That worked for drawings comics, but for realistic drawing, I learned to pay attention to every shadow and highlight, and capture the essence of an object or photograph in front of me. In my sketchbook, I especially liked studying the human eye, as successfully showing the shades of the skin surrounding the eye, creating the delicate folds of the eyelid, depicting the hairs of the eyebrow without seeming too cartoon-ish, and capturing the unique shine of the eye is incredibly challenging yet fascinating to me. At the beginning of the semester, I drew an eye in my sketchbook, which is anatomically correct, but more on the cartoon side of drawing. In the middle of the semester, I decided to start looking at online tutorials for drawing to help my sketches improve, and found one drawing tutorial on the human eye done by a professional artist. I copied her steps, and came up with a more convincing eye. At the end of the semester, I took a photograph of an eye, and carefully studied all of the lights and darks of the picture. Now with a better proficiency with charcoal and an eraser, I was better able to capture the nuances of my subject, and drew a more realistic eye. I have learned a lot from this course, and hope to continue using these tools in future explorations of visual art. Although I will be studying abroad next semester, I hope to continue taking art classes when I come back to Duke in the spring. I've been drawing since I was a little kid and I've found it relaxing and rewarding. I used to think some people were just good at drawing while some weren't. There me a small amount of truth in that, but I'm realizing that time and effort really do contribute to one's skills in drawing. I wanted to learn how to draw realistically, since I usually draw cartoon-type images. It's been pretty gratifying, moving on from my Pictionary-esque doodles to more complex pieces, even when they didn't turn out as planned. I found shading to be the most fun part of drawing, although it sometimes became the most frustraing. Especially when drawing on a deadline, each little mistake feels like a crisis, and perfectionism has to go out the window at some point. Still, though, I'm glad I had a deadline to finsih the drawings or else I might have wanted to give up (as I write this, I'm picturing a large folder of unfinished drawings and paintings I have at my parent's house). Patience and perseverence seem to be key when producing pieces I'm proud of. I was proud of my last few assignments. It has really been rewarding putting the effort into something I care about imroving like my drawing ability. I'm pretty sure that regardless of what classes I take or career I choose drawing is something I will be working on. That being said, I would love to learn more about drawing techniques and challenges. I never thought I would be able to sit outside and literally recreate the scene I'm looking at. I'm looking forward to drawing the landscape at home in Arizona. Coming into this course, I already had a deep appreciation for artists. I think art is such an important component of living a happy life, and so I have always admired all kinds of people who create art. Since I am a dancer, I consider myself to be an artist of sorts, and I have always looked up to certain dancers that inspired me. Now, after completing Drawing 100, I share a similar kind of appreciation for illustrators. I can honestly say that I had no idea how much effort and time must go into each and every piece an artist draws. Every part of every drawing must be so well thought out in order for it to make the right kind of impression on the viewer. Even the smallest areas of shading and texture can make a huge difference to the effect a piece has overall. Another thing that drawing has helped me with is refining my artist's eye. I know that in ballet, it is extremely important to develop a good eye. This allows the dancer to really understand things about other dancers' work and also helps them improve their own dancing. After taking drawing, I feel like I see things differently now. I was able to watch my work change over the course of the semester, and I was also able to observe other people's work and learn from them as well. In drawing so many detailed pieces, I was forced to see things I had never really seen before. And what I realized is that art is all around us, every day. Now when I walk around campus, I find myself noticing the negative space between bars in a railing, or taking note of how certain areas of grass on the quad seem to have a slightly different texture from other areas. Now I see shadows everywhere I look and I notice how different they look at different times of the day. I have become more aware of how the same place can look completely different on a different day, simply depending on the weather. In this way, drawing at Duke has really opened my eyes and expanded my understanding of what art is all about. I was always the girl in high school who wanted to take art but filled all of their elective spaces with AP classes. As a result, my art credit in high school came from AP art history. Art history fascinated me but didn't satisfy my creativity. When I got to college, I wanted to make sure that I didn't get sucked into taking classes I thought would best fulfill requirements, but instead to take the classes that sounded most appealing to me. That's why on an impulse I signed up for Drawing this semester. I have really enjoyed this class and I feel that my drawing has really improved. I definitely want to keep drawing, even if it's just doodles in notebooks and I hope to take more art- like photography- at Duke. It still amazes me how we can start with a big blank sheet of paper and finish with an elaborate scene with shading, details and a narrative. That's one of the things I love about drawing: the power to create a scene of anything imaginable. Before this class, I had always loved drawing because I liked designing new things and creating inventions and scenes. Drawing was a way for me to express the ideas that popped up in my head. Now that I am studying to be an engineer, drawing is very relevant for me because I still like to come up with concepts and design solutions to problems. Drawing is a way to quickly show what you are thinking of and put concrete ideas down. When you put the pencil to the paper, there are no limits to what you can create. During the first class, I wasn't sure what to expect because most of my drawing in the past was drawn based on imagination, and the class was to focus on drawing by observation. I quickly decided that this would be a cool challenge to learn about something I haven't explored very much. Progressing through the class, I indeed learned every day. I learned things like how to use values in my drawing and how to use the eraser to my advantage. I also learned how to compose a good scene and how to bring that scene to life with a narrative. I also learned a lot about drawing with charcoal, which is something I had never used before. I learned a lot about drawing with confidence-- just putting forth your best effort and improving along the way. I felt like I really grew in my drawing abilities. Earlier this semester, my friend asked me to do draw a couple pieces of art for her upcoming senior thesis poetry exhibit. Before this class, I had never really drawn to present as a final result. I mostly drew little sketches and pictures for fun. It was my first real gig as an artist. I doubt I would have accepted if it weren't for me taking this class, precisely because I have learned so much. It was really exciting to directly put my my new skills to use for a good cause. I also realized that now I know about drawing from observation, I can combine that with drawing from my imagination to create almost anything! Being in drawing class was an awesome experience for me this semester. I walk away with a lot more confindence than I had before, and I definitely want to continue growing in the future. A friend told me that the world is a beautiful creation and art is our chance to play a part in adding to its beauty. Moving forward, I hope to reach into the depths of the imagination and add to this world by sharing with others-- all with a pencil and a piece of paper. Drawing has been a lifelong habit of mine. Maybe it's because I'm a visual person, but I always doodle and draw whenever I have time. I love being able to translate what I see in my head into a form that other people can share, whether it is through drawing, writing, painting, singing, or playing an instrument. When I do any of the above, I can sit at my desk for hours without moving or feeling tired. There just some things you can't describe fully with words, and the feeling that you get when you succeed at getting a drawing just right is wonderful and intrinsically rewarding. The problem, recently, is that I don't get enough time to do the art that I want to do. Art is one of my hobbies, so it tends to fall by the wayside when I have a lot of work to do. Although I sometimes feel inspired to draw something, I often can't find time to actually draw it just because life gets in the way. It's an issue of the tradeoff between expressing myself and feeling guilty about my responsibilities or fulfilling my responsibilities and feeling guilty about wasting inspiration. I think of myself primarily as a student who focuses on academics, not an artist who focuses on expression. As such, I try to put my academics first, and when I do end up drawing, it's usually because I'm procrastinating from doing "real" work. This is of course a horrible way of viewing art, and makes it seem much less enjoyable because it's done with guilt. As a solution to this issue, I took Drawing 100 this semester as a wonderful excuse to draw whenever I wanted. Although drawing from observation is not always the most exciting thing, it helped me better understand different methods to approach realistic drawing. Additionally, I loved having sketchbook pages to fill with whatever I wanted to draw. I drew everything that was on my mind-- TV shows, song lyrics, logo designs, etc. -- and it was a very relaxing sort of freedom. I am always happy to have art in my life, and having my drawings count for credit is even better! Overall, I would definitely consider art classes to be a great way to keep up my creative spirit and to keep me sane. I hope I will continue to have the chance to take art classes throughout my college career and in my life. I never saw myself as a patient person, but when I draw, I surprise myself because I take all the time in the world. I obsess over every last detail, and I'm not afraid to get into the nitty gritty and color out ever last brick of Page Auditorium just to get that awesome texture down. And I guess, that isn't the best thing to do, especially when you have 4 other classes to take care of. It's quite hard being an artist at Duke because I don't want to sacrifice the quality of my artwork because of time constraints. I learned so much in the three weeks that I spent working on the Drawing from Observation and Photographs project. I realized that it's quite difficult laying out everything you see in a landscape. One turn of the head and oop! Wow, there's another tree in my view now! I've learned to piece things out with landscapes-- find a focal point in the scene and build it from there. The background: trees, pond...yikes. no. Coming into this class, I wanted to learn how to draw as a means to convey a quick thought that is not easily conveyed through words. For example, in an engineering course, I may struggle to describe a mechanical system, but if I draw the system, my thoughts become clear to others. As I progressed through the class, I learned a significant amount about different drawing techniques, and during this process, I was thinking about ways to apply these techniques to my engineering discipline. For example, learning which details are necessary and which can be omitted when completing a study drawing that accurately describes a scene is invaluable when attempting to convey a quick thought. Additionally, understanding how to quickly describe surfaces through the use of texture rather than precise lines can be used when distinguishing different objects in a quick drawing. These techniques plus numerous others such as shading, line variety, perspective, scaling, will all be extremely valuable as I use them in my work to convey ideas. I love drawing. It's very therapeutic and relaxing for me and functions as my escape from the outside world. With my charcoal pencil in hand and headphones in my ears, I get into a focused but serene mindset while everything around me seems to fade away. I also appreciate the challenge drawing gives me. It forces me to plan, to be patient, to have faith, and learn to improvise when a mark on the page doesn't seem to fit. Additionally there is no greater feeling than the joy that comes with completion of a piece. When I look back and see what I created, I know that it was all worth it: every second, every minute, every cramp in my hand, and every moment of faith taken after my pencil's tip first embraced the paper. Because I have always loved art and the never-ending possibility and open expression it fosters, I am forever exploring new mediums and hunting for interesting ideas to enhance my current set of creative skills. This quest for new channels to provide new materials for innovation has introduced me to some of my favorite mediums, such as acrylics, ceramics, glassblowing, photography, and digital media, influencing my critical thinking in terms of design and aesthetic in fundamental ways. 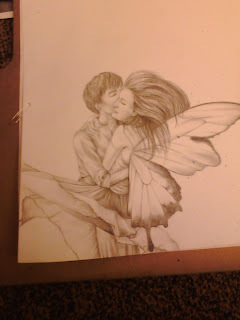 Although I enjoy art in its many forms, I cannot forget my humble beginnings in pencil drawing. I have always put much value in sketching out ideas before putting designs straight into digital software such as Photoshop. Because of its familiarity and my comfort level with the pencil, drawing is very special to me. Returning to the fundamentals of drawing in class this semester has not only been a rewarding experience for me, but has also served as a reminder to incorporate sketching into my daily life. One of the technical skills I have taken from this class is how to work with charcoal, which I was not previously familiar with. Forcing myself to use charcoal and leave my comfort zone (pencil work) proved to be most worthwhile. While I have much to go in terms of mastery of the medium, over the course of the semester I found working with charcoal more natural (and less frustrating, as it certainly was at first) as I refined my skills by practicing in my sketchbook in addition to my assignments. I especially enjoyed composing the final few creative pieces, which got me thinking critically about space and composition, and looking at my surroundings in a different way. I loved making art a more regular part of my life; drawing for this class has been relaxing, enjoyable, meditative, and therapeutic. It has helped me get in touch with my creative roots, which seem to be increasingly pushed aside as I get busier and busier. This is an important realization that has helped put my priorities into perspective—to keep my passions first and foremost. Drawing has gotten me to rethink how I want to incorporate art into my life in the future. I’ve realized that I constantly crave the stimulation that comes with creating something new and innovative, and that I thrive most in creative environments—and while my ideas about the future are hazy to say the least, because of this epiphany, I know that I will be drawing and creating for the rest of my life. Drawing is practice. This is what I realized the last months. It is important to be in the process, to draw each week, to have your pencils in constant motion. It is a practice with no start and no end, and I feel I only restarted thinking about the possibilities it bears. Drawing is so much more than mere representation. I was mainly interested in photography the last years and dealt a lot with the realist perspective in creative expression. The advantage of drawing is that you have an active influence on which aspects of the image you want to highlight, on which parts of the image you want to focus and spend more time on. Drawing has narrative qualities. It differs from film in that it is still, it differs from photography because there is no democratic treatment of details, it offers the possibility to group elements realistically together in a still image but put a focus on them according to what you want to express as in an edit of a film. It seems to be something in between but it is not. It is something beyond modern media. Drawing is a medium that does not include any technology. If you sit down with your drawing board and draw what you see with a pencil or charcoal, you are in an immediate connection and communication with real objects of the world. It is freeing to see how few things you need to establish a narration, a visual narration. And this immediate creative process focuses much more on your skills. Through developing your style the practice of drawing discloses a part of yourself. As a second semester senior, I was fortunate enough to take my first art class before leaving Duke. I regret that this experience came so late in my college career, and that my curriculum was not better filled with creative opportunities such as drawing. In high school, all of my notebooks were decorated with doodles or full drawings spanning across several pages. As I came to college, I noticed that these little embellishments became less and less frequent and then stopped all together as I began taking notes electronically. This is undoubtedly one of my greatest regrets concerning my college career. Although I have had an incredible experience and I am about to walk away with a distinguished degree, my stay at Duke has been relatively void of artistic endeavors. One could argue that writing a paper on the evolution of cooperation in chimpanzees requires creativity, but tapping out an essay at two in the morning doesn't exactly feel like a true artistic exercise. Needless to say, this drawing class was a much needed break in my typical semester drudgery. It was an opportunity to escape for a few hours in the week into pure creation. I came to view our early morning classes as somewhat meditative; for two and a half hours I was immersed in drawing and nothing else. I came to look forward to this block of time as a little solace from an otherwise uncreative existence. However, as time progressed, I began to understand that art and drawing comes with its own set of methods. Line variation, shading and values are all technical aspects of drawing that I used to overlook. As we practiced a new technique each week, training ourselves to draw what we see and not what our brain interprets, I came to understand drawing as its own kind of science. As I continue on into yet another scientific field, I hope to continue to make time for creativity. I loved this class, and my only complaint is that I did not have more time to work on each of my drawings. I plan to cover all of my academic notebooks for the next five years; drawing has been missing from my life for way too long. Last semester I took the Practice Photography 116 with Antonio and I was blown away by the philosophy and peace I learned. He would say our eyes are the best camera there is. And I started to look at daily life differently, all these little moments that are beautiful and we can treasure them. It was a very different outlook on art, a sort of blending of living and art, than I was used to. So this semester I was thrilled to get back to art with my hands. The art I was used to in high school and in the pottery studio during my summers. At first I was taken aback from the straightforward nature of the class, simply sitting for hours on end in the studio drawing the same still life. But I soon realized how luck I am to get out of thinking and processing words in all my premed classes to the processing of objects. Just like in photography when I was looking and acknowledging beauty and trying to capture it, drawing is all about capturing the lines and shades and making something become tangible on paper. Its all very sentimental. 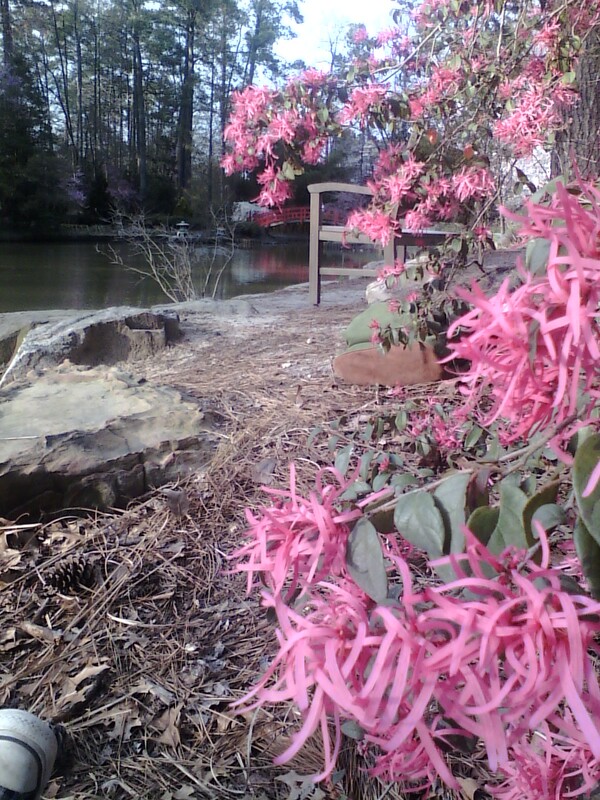 My favorite part of the course was when we took the projects outside. Then I could start to see the lines and spaces and complicated nature of all the scenes. It was fun to try to insert new ideas into a setting, and imagine based on an already known background. It was comforting that I got to put my own style and interpretation of the scene onto the paper, and make what I envisioned in my head work together into the projects. Although, it did take a process to realize the time and effort necessary to fully develop a piece, all that effort paid off because I knew what I wanted my final pieces to look like. I think I have gained a lot of foundational knowledge and practice from this course. I can't wait to take another art class and use all the principles of creating a coherent composition into different mediums and new projects. With the dedication and step by step nature of the projects, I am no longer intimidated by trying to accomplish a full and diverse scene. Thanks Prof Fick for a great semester! Oh Drawing. I love you when I have an idea in my mind, when I can open one of the many boxes in my mind. I hate you when I'm restricted in any way: time, idea criteria, etc. I have a serious problem with myself. I want to spend the rest of my life submerged in art: creating art, helping foster other artists, exhibiting art. My problem is the creating art. I feel like I should be faster when it comes to art, and this class just slapped that fact across my face. I have been the slowest in this class. Assignments that should have taken 4-5 hours took over 10 hours. Drawing little sketches take me an hour or more. When I take longer than I should, I become impatient. I feel like an artist should be patient and can be quick. I'm full throttle ahead with pursuing art for the rest of my life, but I'm afraid I'll be too slow to every create it in time to show anything. I don't know; oh drawing. When I first began to draw for class, it was difficult for me to look at a scene’s individual parts. However, with time, I learned that everyone has their own style and it is the creative way in which you carry our your artwork, that constitutes art and drawing. I get lost when I draw; it is my way of entering a world that no one can see until I make a mark on my paper. I can have my own interpretation of the same scene as someone else. I occasionally doodle on my notes during class; sometimes it is unintentional, but lately it has been intentional. I enjoyed having a sketchbook because there were difficult things that we drew in class (landscape) that was more constrained than in my sketchbook, where I could draw anything I wanted. I learned that my work was more stylistic. I think this is because I like to have my own interpretation of things, which occurs in my everyday life. I enjoy drawing because I get to replicate something on paper as I SEE it. The most difficult part of drawing for me is the shading aspect. It is hard for me to conceptualize where the shadows are and where the light hits specific objects. Another difficult thing to grasp was that everyone has their own specific style and that my stylistic ways were not wrong, but I had to maintain them throughout my artwork. Bill reassured me of this everyday, and I was happy that he did. At first I thought that because I did not draw like everyone else, I was drawing wrong, but I soon realized with the help of Bill’s encouraging words, that drawing is not wrong it just has to be consistent. When researching artists in the Duke library and archive, I came across many paintings by Van Gogh that I felt spoke to my style. Van Gogh was a post-Impressionist painter whose work has a bold color and tone to it as well as a stylistic feel to it. For example, Van Gogh’s painting The Starry Night is very stylistic and has a great dark to light contrast. The landscape and people are very dark, and the drawing is not an exact depiction of the location, but more of his interpretation. I feel like I can relate to this because I tend to have a stark contrast in color since I use dark charcoal in my artwork. I like to have a creative depiction of the location and add my own style to it like Van Gogh. He inspires me to continue my own stylistic artwork. Before I took the class, I was not completely sure what to expect. I figured that we would learn a variety of things and concepts (which we did), but I also thought that we would be able to be more creative in our artwork. It was not until the end that we were able to experiment more by drawing in random objects that were not in our landscape drawing. I can understand that we needed somewhat of a drawing basis before we added it our own creativity, but creativity is what I love about drawing. I hope to continue sketching, especially with charcoal. As Bill says, I was not afraid of the charcoal and used it in my own way. Thank you Bill for a great semester and for teaching me! I put a great deal of time and effort into my drawings even if they are stylistic. Thank you for everything, and I look forward to taking another class in visual arts. Drawing is something that has always been in my life. Whether it was coloring with my 94 pack of Crayola crayons, doodling in my history class, or drawing for an assignment, drawing has always managed to be a part of my life. Drawing is my calming force, my comfort, and I was beginning to lose that when I came to Duke. To many people art is seen as a frivolous activity, one that an engineering freshman has no time for, or so I was starting to believe. How could I sit down and draw for an hour or two, when I had two midterms the next week? I was losing a part of me I didn’t realize I needed. Taking Drawing 100 in the spring reminded me of everything I love about drawing. Drawing allows me to escape from the numbers, theories, and equations being taught to me in every other class. I love to watch as the paper comes to life. It is an amazing feeling knowing you are the reason that blank sheet of paper has depth and realness to it. Every stroke of the pencil or charcoal creates whatever you want and the eraser doesn’t mock you mistakes, it helps to develop the piece. It is a skill many wish to have and a skill that is very easy to loss without proper feeding. This class made me realize that without drawing a huge piece of me is missing; I will never let it fade again. Having never taken an art class before, this semester's drawing class was an incredible experience for me. I found immense joy in escaping from algorithms and chemical reactions for a few hours and finding a sunny spot from which to work. Drawing gave me a piece of mind, a chance to move away from the hectic schedule of daily life and disappear for a time. I loved the meditative affects of drawing, the sense of calm it could inspire, the point of focus it required. Art forces a person to pause. For just a moment in life, one has to stop and really look around, notice the way that lines and shades and shadows somehow create the world that we live in. For the first time in a long time I really considered my surroundings. Sometimes it felt like I was seeing things for the first time, things I had spent months walking by and never really stopped to pay attention to. I hope that the sense of wonder, the attention to detail that drawing has brought into my life will stay with me. I know my sketchbook, at least, will be here to stay. I also really loved this drawing class because it gave me a chance to see other people's art work. Whether it was wandering the exhibition hallways during breaks, or critiquing classmates, we were surrounded by the creations of fellow classmates. It struck me the way in which each piece was so drastically different from any others, the way you could tell at a glance who the author was. Even if we all had drawn the exact same space, the exact same objects, everyone would have come up with a wildly different product, wildly different perspectives and techniques. I was reminded again and again of Oscar Wilde's quote, "Art is the most intense mode of individualism that the world has known". Each drawing, painting, and sculpture seemed to scream, "this is me, this is who I am, how I see the world". Art is truly the product of the person, a reflection of their thoughts, their feelings, the way they hold their pencil. In a world constantly fighting against assimilation, art has already won. I really loved this aspect of the class, and other art classes before us. I feel really thankful that this has been a part of my time at Duke. Thanks for a great semester Professor Fick! It has truly been a very long semester, but it has also been extremely rewarding. Never had I received formal training in art, though I had always enjoyed scribbling on the corners of my papers and sitting down with a few friends, sketching roses and eggs (that's what a Chinese fable said to do in order to perfect art skills). I gained confidence in my abilities this semester - I'm not sure if I've improved in making art, but being assigned to draw on huge pieces of bristol board now is comfortable. It used to be daunting, and the thought of drawing something as large as KVille was a lot of pressure - how could I ever capture what KVille means to Duke, to all of us? I discovered that as long as I started assignments early enough and put enough time into a piece, it could turn our pretty decently. And that's the other thing about art - it is above all a discipline. It takes dedication and commitment, and it takes diligence. Completing a piece is not like working out a problem set in math - in math, there's an answer and an end. Art - you never really know when you're done. There always seems more to do and a finishing touch to add, and that makes the entire process of drawing a discipline. It takes perseverance and bravery to make the first few marks on a giant, blank canvas. It takes dedication and diligence to slowly work through the sketch, shading and value, more sketching, erasing, more shading and value, finishing touches, resisting doubt (am I done yet? But there's something missing, and I can't figure out what...) Finally, it takes a certain amount of willpower to stop, and force yourself to step back and analyze your own work, realize that you've completed what you could for now, and not beat yourself up about "the missing element." And that is exactly what I've gone through each time I started one of our final three creative pieces. I'm not sure if I've learned how to draw better, but I do know that I've gained life experience. I've also gained a new pair of eyes; I look at things differently now. Everytime I pass Cameron, I look at those bricks with both hatred and affection; I look at the blue window pains fondly, remembering just how long and carefully I had to shade them. And I have yet to climb to the top of the Chapel again, but I feel that once I do climb up there, I'll not only see Duke's buildings and the bustop, but I'll see Paris, the Eiffel Tower, the Great Wall, and whatever I want to see. For me, that's art - possibility. Approaching senior spring, I had never taken a college class in drawing. I had always loved drawing as a young girl and found it incredibly relaxing and enjoyable. I always lost myself in my drawings and was able to put my mind at ease. I decided that there was no way that I could graduate Duke without taking a class and enrolled in a course. I was expecting drawing to be an equally relaxing experience and was eager to start my semester. Throughout the semester, I've really enjoyed drawing, but it's not as relaxing as it once was. I felt as though I really challenged myself and pushed limits. The work I am most proud of is that which I've spent numerous hours struggling with the right line or shading. Drawing a picture requires a lot of commitment and patience. I wasn't allowed to just draw an arbitrary line or color in something haphazardly. I needed to focus and abide by certain rules. As opposed to drawing when I was a young girl where I didn't have any rules, now I had to follow guidelines in order to improve... and that I did. I began to enjoy the different challenges of creating not only correct lines, but correct textures and shading. It's a really interesting challenge to see the world exactly as it is and not as you perceive it. For example, If I were to draw a cloud with an outline, that would be incorrect. What a cloud really is is negative space and in order to create the cloud you create everything but the cloud. Also, I found looking at curves to be very interesting or looking at things at angles. Whether looking at a bridge, a chair, a person's face or a hand, angles demand focus and seeing things as they are and not as you wish them to be. I always found that when my mind was struggling with lines that I didn't believe to realistic, I always had to remind myself to be patient as I have found that by the end of drawing that figure, it looked realistic because all of the pieces fit together. While I find drawing more challenging now, I am still able to relax while I draw in my sketchbook. My sketchbook is space for complete freedom and I enjoy experimenting with different drawing techniques (rough sketching vs. precise sketching) and exploring different textures. I feel as though my pencil has movement and takes on a mind of its own. I also really like that I draw in it when I see something neat. I begin to actually see and observe my environment now. I enjoy drawing just as much as I ever have. I continue to find it therapeutic and now find it challenging as well. I think the next thing I'd like to tackle in drawing is human figures. Regardless of whether or not I find a class that will teach me that, I know I'll continue to draw throughout my life. Growing in Charlotte, NC with both parents as computer programers, it would seem hard to imagine how drawing would fit into my life. Despite their seemingly analytical jobs, both of my parents were actually very artistic. My father especially loved calligraphy and sketching. As an engineer by trade, he was used to sketching for blueprints. What he loved the most though was cartooning. He would pack my lunches for me when I was kindergarten and include little drawings of my favorite cartoons. All my father ever wanted me to master was drawing. Every day after school, my parents insisted that I wrote a page in calligraphy and draw at least one picture. I kept a drawing notebook and my drawing skills did increase but never as good as my father. I took art courses in middle school and early high school but lost interest once I came to college. When I told him about this course, he became super ecstatic that I would be able to work on my drawing skills. For the most part, he liked most of my drawings and saw an improvement in my art. I feel like this course gave me a venue to express my self artistically, something which I cannot do in my structures Neuroscience/ pre-med courses. As this semester comes to a close, I've come to the realization that drawing is no different than any other discipline, of the arts, sciences, or otherwise. I am mainly basing this claim on the principle that you will only get out of your drawings what you put into them. I have always been an avid doodler, in notebooks and binders since the third grade, and I have also tried my hand at a few more serious sketches here and there. But I took this drawing course at Duke to branch out a little bit, to learn more of the technique and the intricacies that make the great artists stand out. I learned a ton about shading and value, as well as using a varying thickness of lines in my drawings. One thing I learned that stands out most in my mind is the concept (in drawing from observation) of drawing what my eyes actually see, and not what my mind thinks it should see. When I took a second look at some of my in-class study drawings I realized I had been letting my mind warp the reality in front of me to fit within preconceived constraints, and that blew my mind. Having learned all of this, I found the most challenging part to be applying these concepts to all of my work. I feel like some drawings I spent hours on, some I spent less than an hour, and some I spent over an hour on a particular character while devoting only minutes to the rest of the drawing. The realization I mentioned before came when I realized how obvious these differences are. I feel like I have learned enough in this class to draw pretty well, from observation or otherwise, but creating a good drawing is a matter of taking the time to apply these new skills to the piece in its entirety. In my drawings, there are characters, flashes, bits and pieces of detailed work, coupled with sketchy backgrounds and shaky lines. Obviously in this academic environment we are all pressed for time and sometimes assignments can feel rushed, but I feel like given the freedom of a little space and relaxation, I've learned what it takes to perfect a drawing. In fact, my only real regret for this course is that I didn't take it during a different time in my career, when I could have devoted more time to some of my assignments. Overall, I feel good about my progress as an artist from doodles to large bristol board finished works, and I think I will take away a new perspective of appreciation and admiration for the work of others. Drawing is something so natural and ancient it is no wonder that humans are still intrigued by the idea to this day. Over time, the much has changed about drawing, but one thing remains constant: why we, as humans, make art. From the earliest found cave drawings in the south of France, to the wide variety of styles found today, people have used drawing as a means to communicate their perception of the world around them. This to me is what is so amazing about drawing. It is the most natural way to express one’s self. It is simply a way to show the world how the artist views the world: what is important, what needs to be said. One of my favorite forms of drawing is sand art. A couple years ago I stumbled upon a YouTube video of a woman drawing in sand. It was amazing to see how her hand carved out shapes and they merged from one shape to another, telling a story. Each story was more beautiful and stirring than the last. Here is a link to one of the most famous Sand Artist, Ilana Yahav’s YouTube Channel. I love how Yahav is able to create pictures and stories with only her hands and sand. It just blows my mind. Yahav’s sand ar tis just one of the many new forms of drawing that has cropped up over the years. 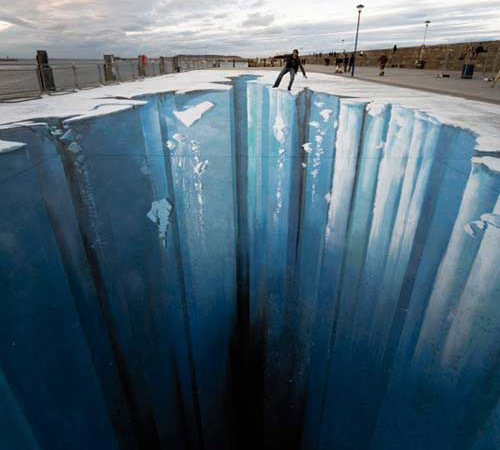 Another one of my favorites types of art to see is chalk art. These drawing are spectacular when see from the correct angle they look as if the world is crumbling from beneath your feet. But from the wrong angle they look like a mess. To me what is so outstanding about these drawings is their realism. I have somewhat of a stylized drawing technique, but I wish to be able to draw with hyper realism, like these street artists. I greatly admire their technique and ability to create surreal works of art that look ever so real. For me drawing is a way to express how I view the world, but also it is a way to challenge myself in a way that my studies do not. I study engineering and therefore I work on problem set after problem set and lab after lab. Sometimes it is very nice to stimulate myself with something so different, like art or writing. That is why I create art, to push myself while exploring new territories. Art is great in many different ways, but one aspect that makes art so great is that 10 different people could have 10 different interpretations of what art is. I interpret art as a person looking within themselves and expressing their feelings and emotions on paper. A good example of this is Vincent Van Gogh. Van Gogh had a very unique style of painting. He painted very roughly, however despite its rough quality his paintings have much beauty to them. This holds true for many artists; the unique style of drawing or painting exhibits much hidden beauty. When people think about art they often think of a pencil, charcoal or a paintbrush, however some may argue that whatever you look at could be considered art. For example there is a famous piece of art done by Marcel Duchamp called “Fountain”, which is a urinal turned around and signed R.Mutt. This is a very interesting piece, but it presents the idea that everything we look at can be defined as art. A great artist, by the name of Jackson Pollock, would make his art by flicking paint onto a canvas in a unique fashion in order to make a design with the drops of paint from his paintbrush. Contrasting Jackson Pollocks art with art that depicts a social setting is hardly comparable, however, I believe that all art has some sort of meaning behind it. With this theory, one of Jackson Pollocks paintings could have deeper meaning to someone than the famous Mona Lisa by Leonardo da Vinci. In the end, all art depends on the viewer. I don’t have one particularly favorite form of art, however I am fascinated by cartoons and animation. The amount of work that goes into making an animated film is incredible. I know that today animation is digital, however it still takes a long time to make a digital film. I got a first hand experience of how much work goes into making an animated film through drawings in a class at Duke. Although our final project required hundreds of pictures to make a 1-minute film, the thrill of seeing the final product, and the fun I had going through the process of making it made all the work worth it. I also like the amount of creativity that comes with making a cartoon, or an animated film. As well as my fascination with cartoons, I also like drawing landscapes from observation, I think this form of art is interesting because it makes the artist concentrate on every detail, which is the complete opposite of a lot of art, where the artist can be as creative as they want. Similar to creating an animated film, this also gives me a great sense of accomplishment when I draw something that looks similar to the scene I am intending to draw. I have really enjoyed this semesters drawing class. It may be frustrating at times to get a drawing exactly the way you want it, however drawing is very peaceful for me and takes my mind off any stress that I might have. I also enjoy the satisfaction of viewing at a finished piece of artwork.